"Port Chisti" is an attractive, high quality, substantial Duck semi-soundfront home, offering a natural private setting, great outdoor pool entertaining area, an abundance of covered and uncovered decking, a well thought out design featuring multiple common areas within the home, all just steps from a great sound access, with deeded ocean access, and a great package of Port Trinitie community amenities. Beautiful soundfront park with pool, pier and water access right across the street! With all the features vacationers desire (bedrooms, commons areas, pool, community amenities, Duck location) this home has great income potential, rental projection of $53,485 gross, $48,895 owner income, based on just 16 weeks booked. (rental history reflects high owner use and limited availability) This well built home sits on a large preferred X flood zone homesite, provides Hardiplank siding, solid pine interior doors, good electronics package, 2017 granite kitchen counters and stainless steel appliances, dramatic 2 story foyer, rec room, mid level sitting / media room, open great room with fireplace and built-in's, and a custom kidney shaped concrete pool with brick coping. Clean, well maintained home with newer 2017 carpet. The outdoor area offers plenty of space for all, overlooked by two levels of decking, with hot tub, outside shower, grilling area, surrounding by beautiful live oaks. Landscaped grounds lead to carport with exterior owners storage and dry entry, rec room, two bedrooms, full bath, and laundry on ground floor. Mid level features foyer, interior owner storage closet, 2 bedrooms sharing a full hall bath, sitting / media room with wet bar, and a large master bedroom. Top floor includes open great room, kitchen and dining, powder bath, and master suite with walk-in closet and large private bath with jetted tub. Large covered rear deck overlooks the pool. Port Trinitie community amenities include large Soundfront common area with pool, pier with gazebo, and boat ramp, Oceanside community pool, tennis, and beach access to the beautiful Duck beaches. Enjoy sunsets, crabbing, kayaking, paddleboarding?....well it's all right across the street. Enjoy the beach all day, come back to a great pool area and sunsets at the sound. Bike or walk to the iconic Town of Duck for all it offers, year round. 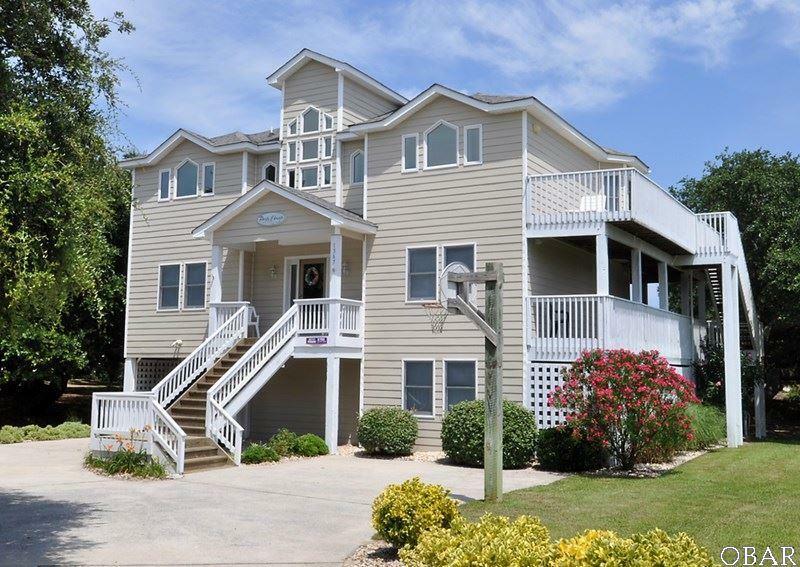 Great property ready for immediate use, enjoyment, and a popular vacation rental. Lots of home, location, land, pool, features, and amenities for the money. Act now to take possession before 2019 vacation season!